The currency of ancient Rome typically consisted of coins made from various metals such as gold, silver, bronze and copper. Various reforms about Roman currency, trading, and finances were undertaken over the course of centuries or ancient rome, and although the coins of this civilisation were made of precious metals such as gold and silver, their actual value was slightly higher than the worth of that quantity of the metal. Having access to strategic locations along the Mediterranean sea allowed the Roman empire to have influence over the trading routes and finances of the region. A variety of coin types were prevalent during different times of Roman currency. The first major development took place in 211 BC when denarius was introduced in Rome. 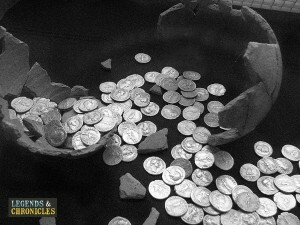 It was a small coin made of silver and had a worth of 10 asses which later increased to 16 asses. Denarius remained an integral part of Roman currency for over four hundred years. There was another coin for half-denarius which was known as quinarius. It was also introduced in 211 BC and had a worth of 5 asses which later increased to 10 asses. Also in 211 BC, sestertius was introduced which had a worth of 2.5 asses. Other important coin types in ancient Roman life included dupondius, assarius, semis, triens, and quadrans. Although the main role of the Roman currency was economic, they also had a political significance which was reflected through the iconography on the coins. During the era of the Roman Republic, the responsibility of deciding the kind of imagery to feature on the coins rested with the committee of tresviri monetales which means ‘trio of money men’. The earliest imagery on Roman coins consisted of a bust of Roma on the obverse with a deity on the reverse. Eventually, the republican coins began featuring the moneyer’s name. Sometimes, they even displayed images related to the family history of the moneyer. There was a clear shift in the nature of the currency before and after the establishment of the Roman Empire. The change came about soon after the establishment of the Empire when Julius Caesar issued coins with his own image. Earlier coins had featured portraits of the ancestors but the coins of Julius Caesar were the first ones to portray a living person and an emperor. Over the subsequent centuries of the empire, portraits of various emperors appeared on the coins of ancient Roman empire. A selection of Roman coins, a commonly used currency. The system of Roman currency was strictly regulated by the authorities. The responsibility of deciding the kind of imagery on the coins was with the committee of tresviri monetales meaning ‘trio of money men’. These people were authorised to create a centralised and standardised Roman currency. The moneyers produced the currency under the guidance of these committees which was three in number during the Roman Republic and were increased to four during the reign of Julius Caesar at the end of the Republic. Roman society was a vast empire and trade between different parts of the empire was a vital feature of the economy. The Empire was situated along the most important trade routes of the time in the Mediterranean world and also had trading links with the other countries and empires of the time. The most important trading port of Rome was Ostia which was located at the mouth of River Tiber. It was responsible for trading between Rome and Carthage as well as with the provinces of Spain and France. The Romans had also established trade links with North Africa and Middle East. Other than trade between Rome and other countries and empire, extensive trade also took place between different provinces of the empire itself. The peak era of trade in ancient Rome when the number of workers involved in industry and trade was highest was from 2nd century BC to 2nd century AD. However, trade was usually considered a suitable profession for the common people and the elite preferred to stay away from it. During the later years of the Western Roman Empire, trade declined in the western part of the empire but continued to flourish in the eastern part after the founding of Constantinople. The ancient Roman government financed itself through various taxes, trades with other countries, and bounty from the war. During the early years of the Republic, taxes were as low as 1% of owned property and wealth. The tax was increased in the event of war to as much as 3%. Taxes were mainly levied against real estate, slaves, animals, and other goods. Around 167 BC, Rome captured the gold and silver mines in Spain which enriched the government finances and there was no further need to levy taxes on the Romans. The most important way of payment was, of course, the ancient Roman currency mainly in the form of gold and silver coins. However, there were also other means of payment. For instance, farmers would sometimes pay their taxes in the form of food if they did not have enough money. Similarly, barter trade also existed in ancient Rome where goods were exchanged for other goods. Thus the mode of payment was mixed with payments sometimes done in currency and sometimes in kind. With the passage of time, however, use of coins as a mode of payment increased particularly after the conquest of the gold and silver mines of Spain. Ancient Rome was a huge empire which stretched over three continents at its height, and thus there was extensive trading going on, not just with other countries and empires but also between different regions of the Roman Empire itself. Rome was nicely situated geographically and along with strategically important trade routes of the Mediterranean Sea and had a virtual monopoly over the regional trading and finances. The currency of Rome we have now learned mainly consisted of gold and silver coins which were minted under the guidance of the special committees constituted by the government. The practice of displaying the portraits of the emperors began with the establishment of the Roman Empire in 27 BC.